The Tension-Quik is a low cost, easy-to-use screen stretching system. Combined with static stretch & glue frames, the Tension-Quik, as an adjustable or welded stretcher, is the least expensive route to high tension screens. As a frame, it provides a fast screen making system. One tool…one motion. 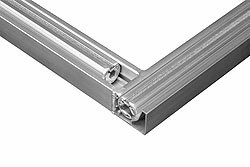 The Tension-Quik is primarily manufactured as an adjustable screen stretcher for glue-on frames. Four independent channels link together allowing the unit to slide in and out, adjusting the size of the stretcher in both directions. The channels enclose a tensioning roller that ratchets in a clockwise rotation to tension the mesh. Each roller captures the fabric easily using either a Top Loading or Keystone fabric locking system. The welded stretcher operates in the same manner as the adjustable unit, only the frame channels are welded to one specific size. This models is recommended only when one frame or similar frames sizes are being tensioned by the unit. The Tension-Quik can also be manufactured as a printing frame. 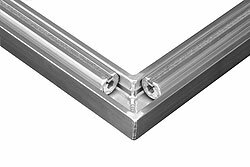 As a frame, the corners of the frame channels are mitered and fully welded. Guaranteed watertight. 96 inches and is only manufactured as an adjustable stretcher. The two locking systems available with the Tension-Quik are the Keystone Single Nylon and the Top Loading Double Nylon. 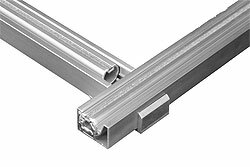 The Keystone Nylon system utilizes a single tapered nylon rod which slides into the roller through the end of the frame channel. This system is recommended for large stretchers because of its pre-tensioning ability. 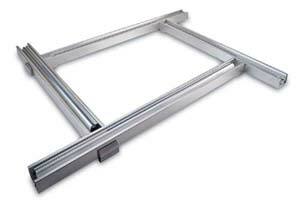 The advantage of this locking system is the easy corner softening ability for all frame sizes. One locking rod handles most all mesh counts, including wire meshes. Undersized black Keystone rod available for very coarse meshes. 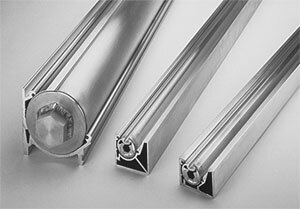 The Top Loading system uses two round rods which are snapped into the roller with the assistance of a wheel type insertion tool. This systems allows for the fabric to be secured simply and evenly. The round nylon rods come in three color coded diameters to accommodate the various mesh thicknesses. The standard blue rods typically work with all meshes between 110 and 305 threads per inch.